Selangor, Malaysia, Aug 5, 2017 - (ACN Newswire) - Grey mangrove trees, Avicennia marina, filter heavy metals out of the surrounding soil and water. A new study from Indonesia has found that their leaf litter accumulates the most copper, followed by leaves and then roots. Researchers from Universitas Diponegoro analysed copper concentrations in a mangrove forest in Tapak Tuguerjo, an area along the northern coast of Java, Indonesia. The forest is downstream from a river polluted by a nearby factory. Copper concentrations in seawater samples from the study area ranged from 0.02 milligrams per litre (mg/L) to 0.05 mg/L; as much as six times the 0.008 mg/L maximum permissible level for marine biota set by the Indonesian Ministry of Environment. Over the span of 12 weeks, the team collected samples of water, soil, roots, young leaves and leaf litter (fallen leaves). After drying and grinding the plant material, they analysed its copper content using atomic absorption spectroscopy. They found that copper concentrations in the plant material were up to ten times more than the water samples. Leaf litter carried the highest concentration, followed by live leaves and then roots, according to the study published in the Pertanika Journal of Tropical Agricultural Science. The results confirm findings from several other studies and demonstrate the mangrove's ability to defend "itself against contaminated environments by excreting copper through its leaves, which will then be discarded through defoliation." 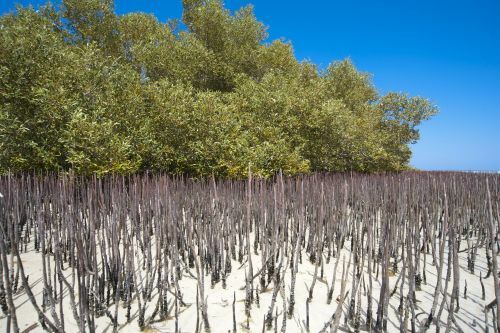 Mangroves are able to do this better than many other plant species, due in part to their adaptation to living in coastal zones, where they absorb and eliminate salt in a similar way. As the leaf litter breaks down, copper can then be reintroduced back to the soil and water. However, the researchers suspect the impact is minimal: the estimated amount released is less than 3.5 percent of the total absorbed, and is spread over a large area. Pertanika Journal of Tropical Agricultural Science (JTAS) is published by Universiti Putra Malaysia in English and is open to authors around the world regardless of nationality. The journal is published four times a year in February, May, August and November. Other Pertanika series include Pertanika Journal of Science & Technology (JST), and Pertanika Journal of Social Sciences & Humanities (JSSH). JTAS aims to provide a forum for high quality research related to tropical agricultural research. Areas relevant to the scope of the journal include: agricultural biotechnology, biochemistry, biology, ecology, fisheries, forestry, food sciences, entomology, genetics, microbiology, pathology and management, physiology, plant and animal sciences, production of plants and animals of economic importance, and veterinary medicine. The journal publishes original academic articles dealing with research on issues of worldwide relevance.